The kangaroo in today's culture has been popular as a sports mascot, as stuffed animals and kangaroo car stickers and decals from Australia are popping up everywhere. Why Is the Kangaroo So Popular? The kangaroo appears in Australia's Coat of Arms and Qantas Airlines uses it as their logo. It is featured on the Australian penny, half-penny, and dollar coin. The kangaroo has been used as a mascot in Australia's 1983 America's Cup and 1982 Commonwealth Games and has delighted youngsters in numerous cartoons. In the United States, mascots include Kangaroo Kasey at the University of Missouri-Kansas City, Zippy of the University of Akron, and Lizzie of Lake Washington High School to name a few! In agriculture, the kangaroo initially was used in the Victorian era as a coat of arms and more recently as motifs on commercial buildings in Melbourne Australia. Cartoon kangaroos like Skippy the Bush Kangaroo, Kangaroo Jack, and Hallmark's Whazzat Kangaroo have delighted children of all ages. From Proctor and Gamble utilizing the kangaroo for their Aussie hair products to Ricky Kangaroo in the Legend of Zelda video games, kangaroos are cute, loveable, and as car stickers they are a way to show your kangaroo pride. Zazzle.com - This website offers a large variety of kangaroo car stickers from photograph-like stickers to cartoon stickers to I love kangaroo stickers. Choose from the Down Under or Bust sticker, Joey the Kangaroo sticker, Caution Kangaroo Crossing sticker, and even a boxing kangaroo! This company accepts Paypal, and is a Better Business Bureau accredited member. 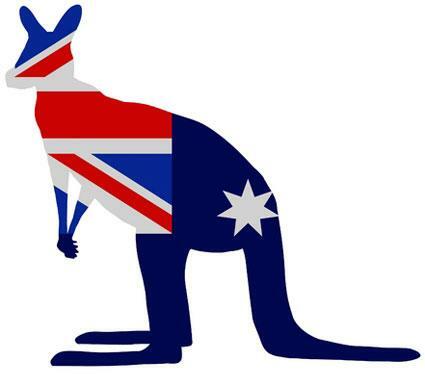 Aussie Products - Here you'll find over 4,500 products from down under including kangaroo car stickers. They offer great Steve Parish kangaroo stickers or you can choose an Australian flag and kangaroo sticker. Aussie Products has a toll-free number and accepts all major credit cards. Car Stickers - You'll find five varieties of kangaroo car stickers from Australia. Each sticker is made of one color and are vinyl cut-out decal stickers that come in small, medium, and large sizes. Car Stickers also offers a great FAQ page to help you apply your car stickers correctly. Amazon - On Amazon, you'll find a giant lime green kangaroo car sticker that also comes in white and black vinyl. Dress up your car's back windshield with this delightful kangaroo. Check Out - Make sure the website you are shopping on has a secure server so your personal information is protected. You can tell if a site has a secure server if you see HTTPS in the URL line. Return Policy - Inquire about a company's return policy if you're product is damaged and you need to return it. Non-US Websites - If you find a non-US website that sells kangaroo car stickers, make sure they ship to the United States. Permission - Ask your parents for permission first before you order anything online. Reputation - Only order from websites that have a good and reliable reputation, are members of the Better Business Bureau, or have the VeriSign logo. Collecting and accessorizing your car with kangaroo car stickers from Australia can be a fun hobby, so why not start your collection today?